She hasn’t raced 26.2 miles since 2017, but she made a pact with Joan Benoit Samuelson that on April 15, they’ll see each other on the starting line in Hopkinton. Jordan Hasay was confident in her fitness and her ability to contend for the 2018 Boston Marathon title. But the night before the race, she withdrew after a last-minute MRI showed a stress reaction, a precursor to a fracture, in her left foot. 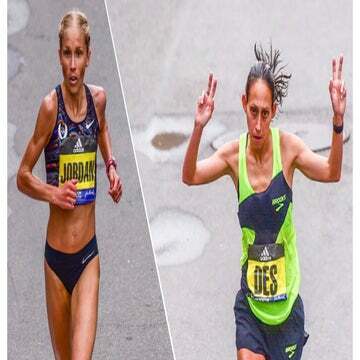 Instead, Hasay, who is the second-fastest American female marathoner in history (2:20:57 at the 2017 Chicago Marathon), watched the race unfold from the bar in the Fairmount Copley hotel, as Desiree Linden tore through the rain and wind to become the first U.S. woman to win the race in 33 years. Now, after a long recovery from multiple foot fractures in the past year, the 27-year-old who trains with the Oregon Project, under coach Alberto Salazar, has found confidence in her running again and hopes to build a streak of victories for the Americans. 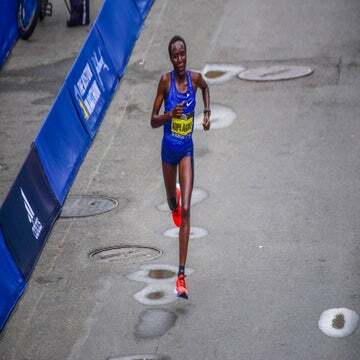 She has raced twice in her build up toward the 2019 Boston Marathon—in early March at the Rome-Ostia Half Marathon, where she was sixth in 1:11:06, and the Shamrock Run 15K in Portland, Oregon, where she was first in 51:34, and went on for 23 total miles that day. 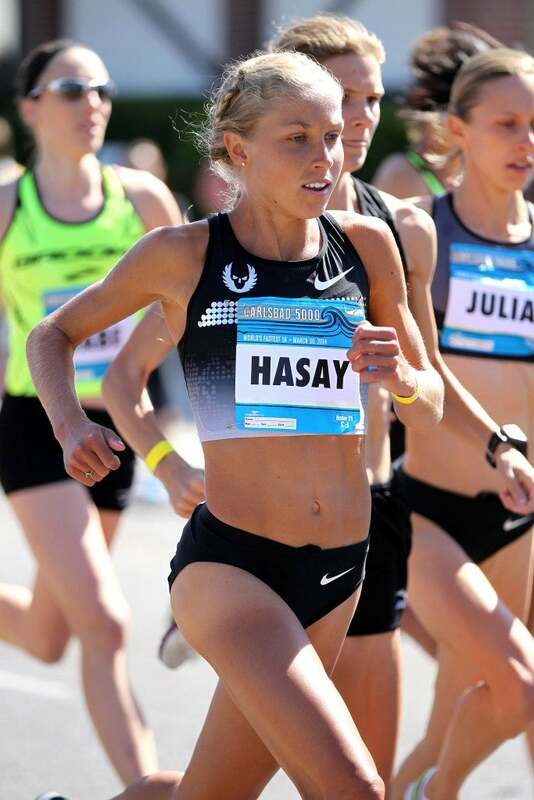 Hasay talked with Women’s Running over the phone as her taper for Boston began, covering everything from injuries to her special pact with Joan Benoit Samuelson, to how the staff at the Oak Bar reacted to Linden’s victory last year. Compare how you were feeling at this time last year to how you’re feeling today. It’s like checking the final boxes now. I did my last long run and last long interval workout. I just feel really thankful, of course, because this time last year I was dealing with my stress fracture. I was trying to toe the line with a broken foot, so it’s hard to forget that. It makes me so grateful to be healthy. It takes the nerves away and makes me excited to race. You know I haven’t raced a marathon in over a year [the 2017 Chicago Marathon]. I’m excited about the process and being out there again. Last year I was getting MRIs the day before the race so it’s going to be really nice not to deal with all that stress this year. I’m just grateful that I’m able to be back at the level I was. I think I can do really well. I have a level of confidence in the training I’ve done even though I haven’t raced a marathon in a while. I’m excited to see where I’m at and run the best marathon I can run, really. Can you tell me more about your experience last year? There was so much hype surrounding the race between the American women—specifically you, Linden, Shalane Flanagan, and Molly Huddle. But then you had to scratch and the weather was ridiculous. It’s a little bit crazy. I did the press conference [on Friday] and felt ready to go. I’m grateful to my team before the marathon, after it, and this whole year. My acupuncturist came, my physical therapist came, everybody came to Boston to try to get me to the line. I have a pretty good pain tolerance, so I was ready to race even though my foot was hurting quite a bit. Then of course we had the MRI and it was a no-go. I was watching the race at the hotel bar and I know [Linden] goes there every year for her post-race burger—when she won, the server was tearing up and crying and everything. It was so motivating. It’s crazy thinking back on last year—now I feel like the pressure’s off so much. I wanted to win so bad last year and of course I do this year, too, but we all felt like it was our duty, as the American women. I thought I’d feel different because I wanted to be the first one, but I don’t feel like if I were to have the honor of winning this year that it would be diminished in any sense—it’d be cool to continue the streak. Des started something and Shalane did too, by winning [the 2017] New York City Marathon. We want to continue the streak and do really well. You’re close with Joan Benoit Samuelson, who’s running to celebrate the anniversary of her first Boston win. Have you talked to her? She’s been a big motivation to me during this training cycle. I promised her I’d get to the start line. We promised each other because we’ve both been a little dinged up. Any time I think about doing an extra interval or extra mile, I think, “No, no Jordan, you promised Joanie. Just get to the start line.” I just texted her the other day to say I’m so happy we’re both getting there. It’ll be fun. I’m really glad she’s racing. That feels really special, too. What has your recovery from the injury been like? I took a month off after Boston [a year ago], then started back training again. It felt good until mid-July, when I started to feel the same pain again. I got an MRI and it turned out I got another two fractures in the same bone [in the left heel]. That was really tough having to shut it down again. I had to miss the Chicago Marathon. At that point I took 10 weeks off, didn’t do anything for a week, and then all I did was swimming. Before I did some biking, but this time I was serious about it. I got a scooter and didn’t step on the foot or do anything on it for a long time. I was just resting, sleeping—I was really serious about the recovery. I tried to see it as a building block for the next cycle, not only this year but the Olympics. As much as I hated starting completely from scratch, it’s been neat to see how far I’ve come and feel really fresh, too. Some marathons, like Chicago, I felt like I needed the taper. I was on the edge of being burned out and pushing too much. This time I’m raring to go. I feel mentally really fresh and really good. It’s a really great spot to be in. Have you looked at any goals beyond Boston? Will you race a fall marathon or head straight to the 2020 Olympic Trials in February? I’ll race a fall marathon. I’ve only raced two marathons ever, so I want the experience. We trained pretty hard and I’m running pretty big miles. I’ll take a break after Boston and then have another build up, because you learn from each one. Every build up is different so it’s good to learn. What are some of the key lessons you have learned from your marathon training cycles? This time, I’ve just been cautious not overdoing speed work too early. I think I was just unlucky with my left foot, where I had the fracture, it pronates quite a bit so I just had somebody look at the footwear. Nike did a great job at building some different options for me to correct the pronation, so I feel really confident in that. It was a luck thing and a footwear thing instead of a training thing, but we did cut my miles a little bit by five to 10 a week. It’s hard to tell myself to just be average, but surprisingly progress comes along when you’re not pressing the limits. I’m right where I want to be. I’m not sure if I’m fitter than Chicago, but right where I was. It’s a little bit scary when you’re starting out and you don’t know if you’ll ever be at that level again. That’s big for me—now I know I can take a big break between marathons, which is also an important lesson I learned. After Chicago in 2017, I wanted to go and win Boston the next year. It was something I really wanted to do and maybe I pushed too hard in the fall when the timing wasn’t right. Now I know I can get fit pretty quickly. What will you consider a successful day in Boston? I just want to run the best marathon I can run. If I can run to my fitness level, I think I can be where I was in 2017 [third in 2:23:00], or better. I’d like to be on the podium. It depends on the competition of course. I think I can be right up there with the top group. I feel really thankful that the training has gone in such a way that I can be confident and be with the lead pack. What do you think about the competition this year? They always put together a strong field and all the Africans really show up to compete. They’ll be up there. It’s nice having Des in there. She’s super experienced on the course—if you follow her for the first half, you can’t really go wrong. That’s kind of what I did my first year, so it’s really nice having her in there. She’s a great person—she’s a sense of calm in there. It’s cool having her back as a champion. There’s still a lot of excitement around the Americans again. I think we could have another winner in there, so hopefully we can continue it on or at least we can all finish high up there.